See MPEP § 402.05(a) for applicant revocation of power of attorney in applications filed on or after September 16, 2012. For revocation of power of attorney in applications filed before September 16, 2012, see MPEP § 402.05(b) for revocation by the applicant and MPEP § 402.07 for revocation by the assignee. See 37 CFR 11.116 for information regarding permissive and mandatory withdrawal. When filing a request to withdraw as attorney or agent of record, the patent attorney or agent should briefly state the reason(s) for which he or she is withdrawing so that the Office can determine whether to grant the request. Among several scenarios addressed in 37 CFR 11.116(b), subsections (5) and (6) permit withdrawal when after reasonable warning the client fails to compensate the practitioner, or when the representation "has been rendered unreasonably difficult by the client." When preparing a request for withdrawal for such reasons, the practitioner should also be mindful of 37 CFR 11.106, which requires a practitioner to maintain the confidentiality of client information (except in limited circumstances). Where withdrawal is predicated upon such reasons, the practitioner, rather than divulging confidential or secret information about the client, should identify the reason(s) for requesting to withdraw as being based on "irreconcilable differences." An explanation of and the evidence supporting "irreconcilable differences" should be submitted as proprietary material in accordance with MPEP § 724.02 to ensure that the client’s confidences are maintained. 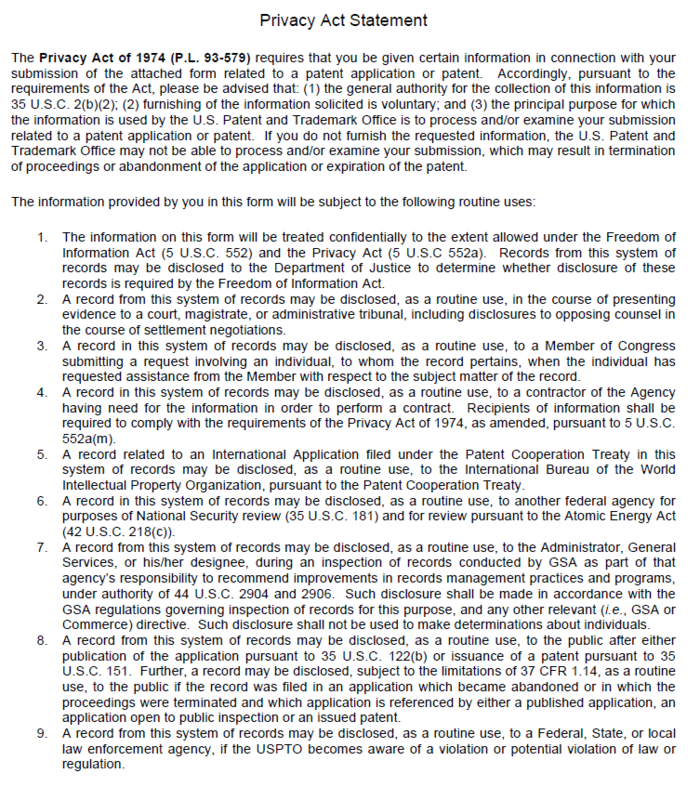 The Request for Withdrawal As Attorney or Agent and Change of Correspondence Address forms (PTO/SB/83 or PTO/AIA/83, available at www.uspto.gov/patent/patents-forms ) provide a section wherein practitioners may certify the completion of activities necessary for the request to withdraw from representation to be granted. 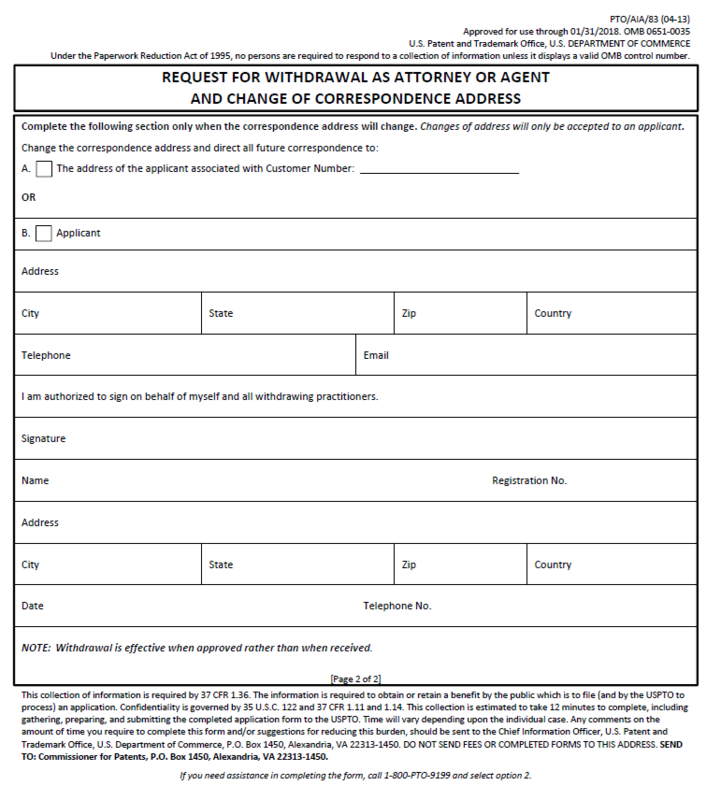 A Request for Withdrawal As Attorney or Agent may alternatively be filed as a Web-based e-petition (see www.uspto.gov/patents-application-process/applying-online/ epetitions/epetitions-faqs for more information). 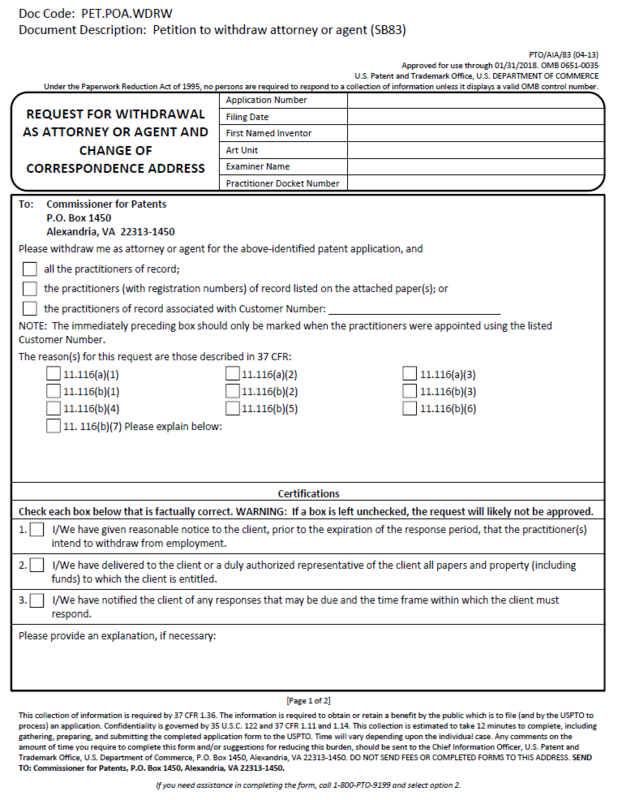 When the correspondence address will change as a result of withdrawal, the withdrawing practitioner(s) must request that the Office direct all future correspondence to (i) the first named inventor or assignee that has properly made itself of record pursuant to 37 CFR 3.71 (for applications filed before September 16, 2012), or (ii) the applicant (for applications filed on or after September 16, 2012) or (iii) the assignee of record (for proceedings involving issued patents). Practitioners may do so by specifying either the correspondence address of, or the address associated with the Customer Number of, any appropriate party as specified above. Withdrawing practitioner(s) cannot change the correspondence address to the address associated with the Customer Number of another law firm, or any other address except as noted above.